Sigmund Freud, born Sigismund Schlomo Freud, was an Austrian neurologist who founded the discipline of psychoanalysis. Freud's family and ancestry were Jewish, and Freud always considered himself a Jew, although he rejected Judaism and had a critical view of religion. Interested in philosophy as a student, Freud later turned away from it and became a neurological researcher into cerebral palsy, aphasia and microscopic neuroanatomy. 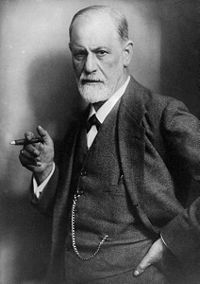 Freud went on to develop theories about the unconscious mind and the mechanism of repression, and established the field of verbal psychotherapy by creating psychoanalysis, a clinical method for treating psychopathology through dialogue between a patient (referred to as an "analysand") and a psychoanalyst. Though psychoanalysis has declined as a therapeutic practice, it has helped inspire the development of many other forms of psychotherapy, some diverging from Freud's original ideas and approach. Freud postulated the existence of libido (an energy with which mental process and structures are invested), developed therapeutic techniques such as the use of free association (in which patients report their thoughts without reservation and make no attempt to concentrate while doing so), discovered the transference (the process by which patients displace on to their analysts feelings based on their experience of earlier figures in their lives) and established its central role in the analytic process, and proposed that dreams help to preserve sleep by representing wishes as fulfilled that would otherwise awake the dreamer. He was also a prolific essayist, drawing on psychoanalysis to contribute to the history, interpretation and critique of culture. Freud's theories have been criticized as pseudo-scientific and sexist, and they have been marginalized within psychology departments, although they remain influential within the humanities. Freud has been called one of the three masters of the "school of suspicion", alongside Karl Marx and Friedrich Nietzsche, while his ideas have been compared to those of Plato and Thomas Aquinas. Denken Sie and den betr�benden Kontrast zwischen der strahlenden Intelligenz eines gesunden Kindes und der Denkschw�che des durchschnittlichen Erwachsenen.